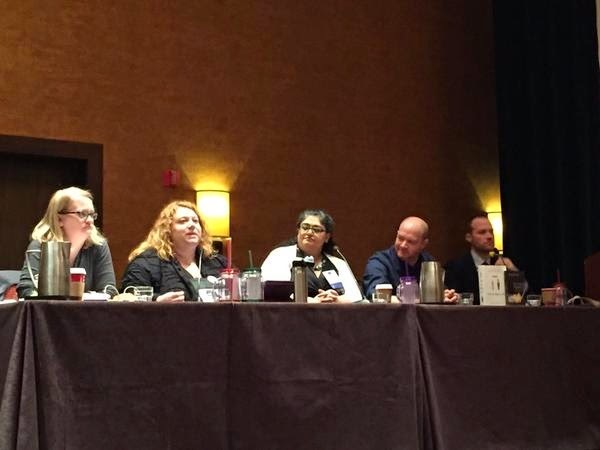 Over at School Library Journal, I have an article up: Five Things to Love about the YALSA YA Lit Symposium. Can you guess the five things? One is the opportunity to present. This year, I was on a panel -- and here's a photo of me on the panel looking oh so serious. Thanks to @meghuntwilson for the photo. Also pictured: E.M. Kokie (Personal Effects, Candlewick, 2012); Swati Avasthi (Chasing Shadows, Knopf, 2012), Steven Brezenoff (Guy in Real Life, Balzer & Bray, 2014) and E.M. Kokie (Personal Effects, Candlewick, 2012); along with Andrew Karre, editorial director at Lerner Publishing Group. Not pictured, the moderator Blythe Woolston (Black Helicopters, Candlewick, 2013). Anyway, go over and read the whole thing and let me know what you think!